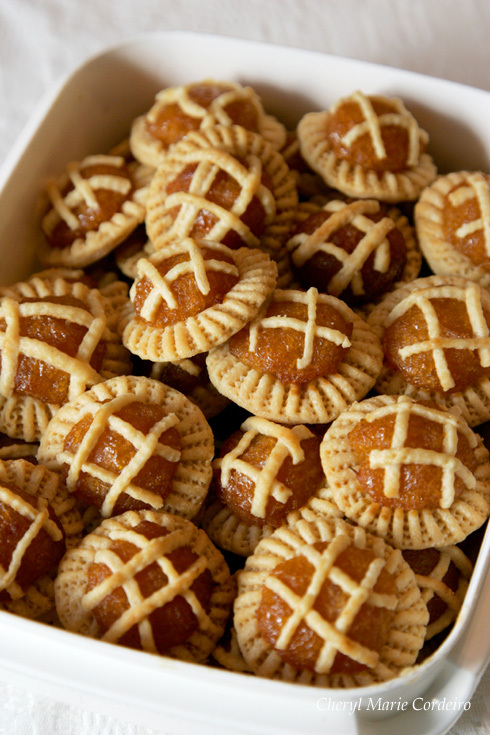 Pineapple tarts with a pinched pastry base. Every year, it is with mixed feelings that I begin looking around for ripe pineapples for the annual Christmas batch of pineapple tarts. All things considered I think this is one tradition I grew up with in Singapore that I would consider giving up if my northern Swedish husband had not grown an unexpected liking of them. As it turns out, he loves pineapple tarts and most other exotic fruits including durians. 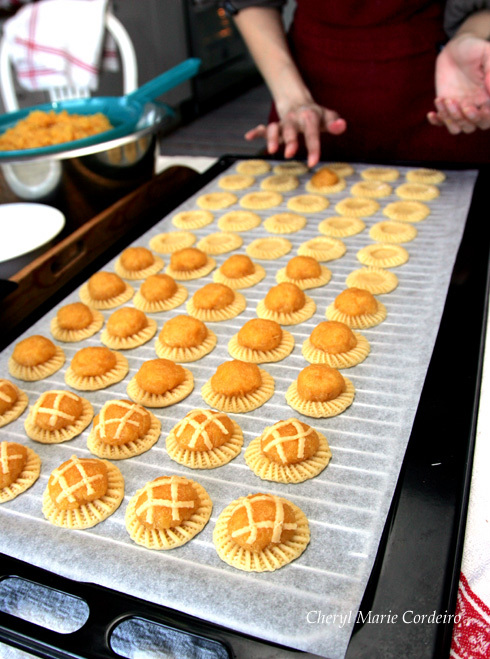 Done in the traditional way it is a very, very time consuming task to make pineapple tarts. The failure rate is also high and the rewards questionable, except the fact that however criticized your delicate small masterpieces would be, any number of them still finish within minutes! When it comes to pineapple tarts, as with other traditional food such as American apple pies and Swedish meatballs everyone’s an expert and we all have our own favourite method of making it – which by definition is the best – and it is not before all have been tasted that you can decide which your favourite flavour, size, crust, color of jam, with or without “crown” etc., is. Personally I love it when the jam turns out crisp and caramelized on the outside and moist on the inside when sitting on a lightly golden browned pastry base. Anyone in Singapore – Malays, Peranakans, Chinese and Eurasians – will have a ready answer exactly on how a perfect pineapple tart should be. And they will all be different. For the true fan it is worth the effort trying all varieties, because both pastry and jam do have different consistencies and tastes. It’s like wine. Nobody would settle for just “red”. Depending on who made them, they are all different. 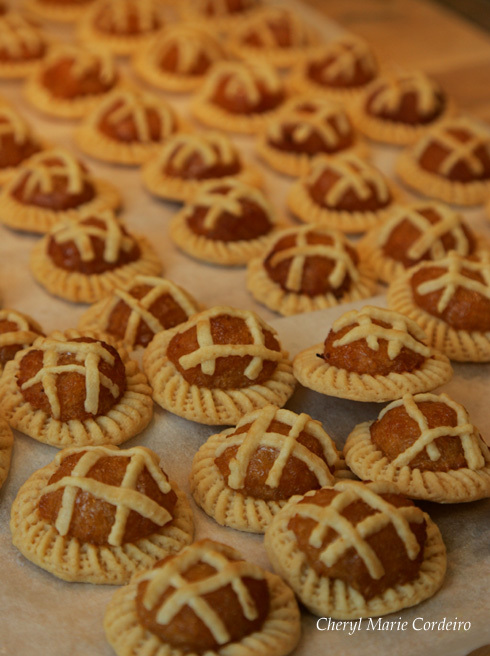 Today pineapple tarts are available at some bakeries all year round in Singapore and Malaysia, however tarts are still most abundant during festive seasons. In my culinary background I inherited the Eurasian Sugee Cake from my father’s side, while my mother taught me how to make Pineapple Tarts. Large pineapples, near overripe, are the best for making pineapple jam. When I was young, my mother would bake bake about 350 – 400 tarts for Christmas. At age three I was only allowed to watch. 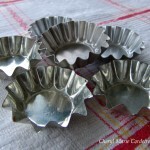 At age five or six I was allowed to help punch holes at the center of each pinched pastry base with a small 2-pronged fork. Then I got promoted to punching out the pastry rounds out of the flat dough, subsequently flattening the sides to each base and finally, pinching them all around. For the longest time however, I was not allowed to put the jam dollop onto the designated spot on the tart. The reason being that if this was not done right and with a steady hand, the spilled jam would caramelize and stain the tart during baking process. Needless to say the exacting process of weeding out the less than perfect tarts rendered both me and my mother quite tired of tarts long before the ones deemed perfect enough to be served were presented to our guests. Today the traditional way of making tarts using the wooden and copper ring moulds is so time consuming that it’s almost ridiculous. Still this is exactly what I am going to do here. Ever heard of the Julia/Julie project, just recently turned into a movie with Meryl Streep in the lead role as Julia Child? Well, this is the Cheryl/Mum project. 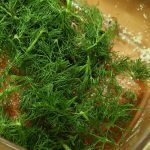 For anyone wanting to try your hand on this daunting task, or just want to compare notes, here is my recipe on my version with all the tricks of the trade added in when appropriate. The basis for good pineapple tarts begins with finding ripe pineapples. This is always more of a problem in Sweden than in Singapore. 8-10 large pineapples would render about 400 tarts, so that is what we aimed for. To manage better, you could separate the tart project into three separate sessions as in jam making one day, pastry making one day and putting the tarts together and baking, on day. For the baking, you ideally rein in any loose straying boyfriends, husbands, children and grandchildren to help (it’s very “Peranakan” to use help from the grandchildren). This is definitely the tradition and will also put a cap on the amount of complaints you will get about lack of pinching, uneven dollops of jam and why there is only a single or no cross on all of them and so on. Using a modern plastic mould, the process could be shortened some but that would be cheating. 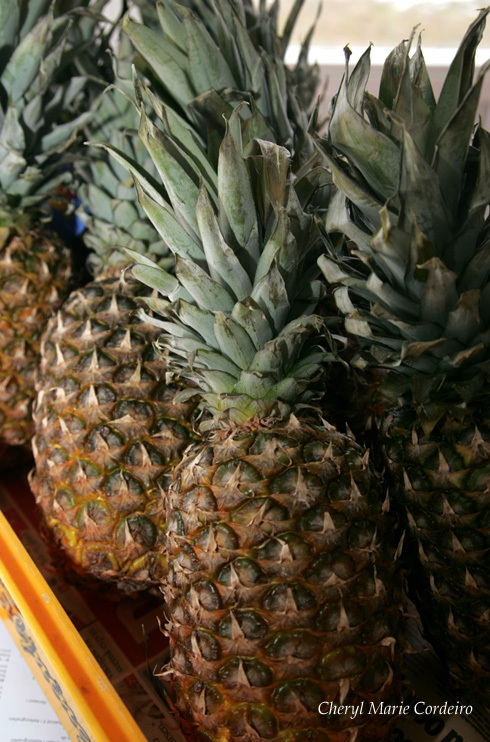 In Singapore, one could easily purchase pineapples already cut up and prepared for the chopping or grating as readily as you could a fillet of fish. 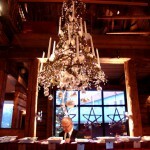 In Sweden however, most people appear to use pineapples as Christmas decorations having only a vague idea about how to get the fruit out of its forbidding peel. Although they were offering a nifty pineapple peeler-corer at the recent Food Fair in Gothenburg, the fastest way to produce results is by just using a knife. 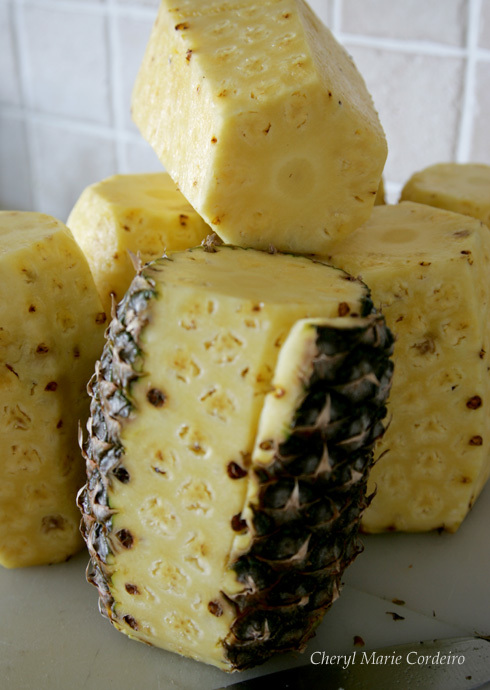 Slice the skin of the pineapple, leaving about half or a third of the eyes still in the fruit. 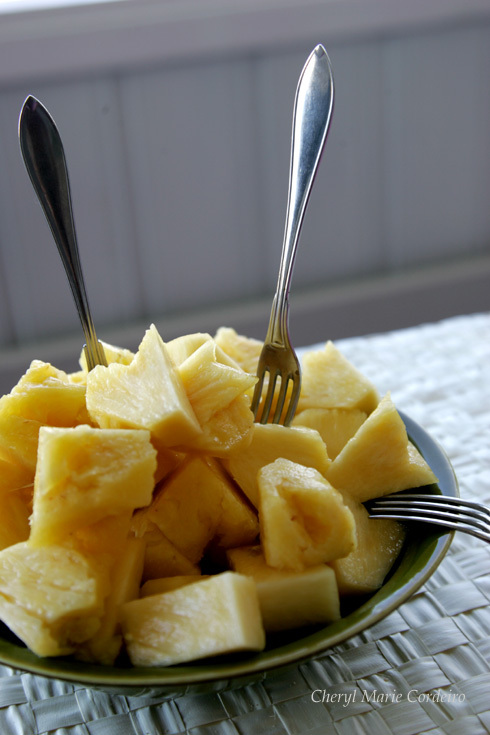 Then remove the remaining eyes and small seeds by cutting a diagonal spiral around the pineapples with a sharp knife. Don’t be too finicky or you’ll never be done with even this first step. Once the seeds and eyes are gone, grate the pineapples by hand. 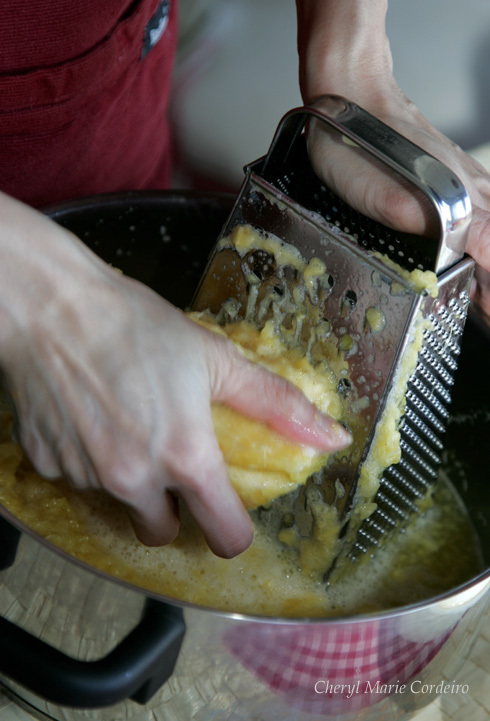 The grating produces long strings of pineapple that lends a chewy texture to the jam that I prefer over finely pureed pineapple in jams. You can liken it to having chunky peanut butter instead of smooth peanut butter or strawberry jam with large strawberry chunks in them rather than a smooth strawberry jam. 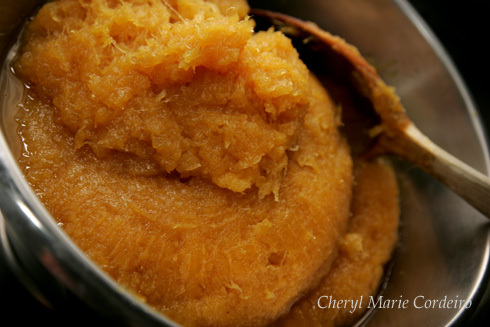 A food processor will produce a mush that plain and simple will not work. You need the fibers in the jam or the baked jam will be too hard and dry. See, here it starts. (You have grated the jam too much, too little, too soft, too this, too that, bla, bla, bla). Now, lets get on with it. Admittedly the pineapples we brought home this year were too temptingly ripe and sweet, so we kept one for eating rather than putting all of it into the jam. Pure tropical delight in the middle of winter here in Sweden! Grated pineapple boiled with a stick of cinnamon and sugar. 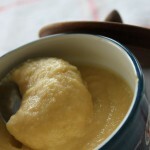 The pineapple jam will reduce, thicken and turn a darker golden hue when done. 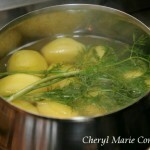 The grated pineapple, together with its juices are put into a large pot and put on low heat. 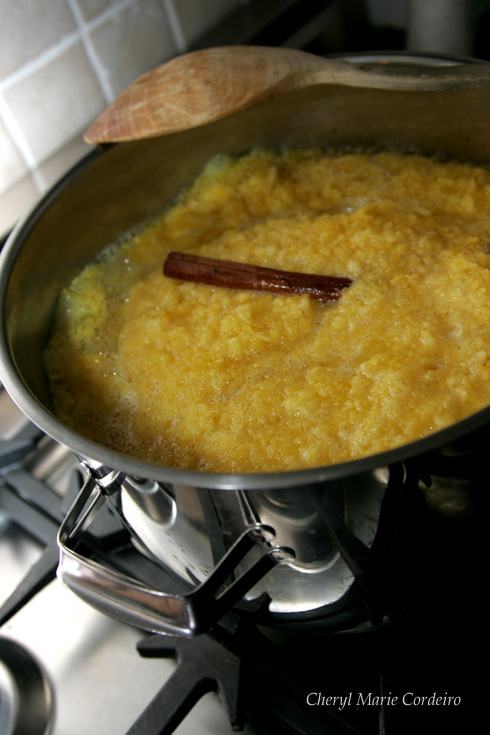 A stick of cinnamon and some sugar or honey goes into the pot. After several hours, the resulting pineapple jam should be reduced to about half of what you began with and the colour, a golden yellow. The word jam here is misleading but the best I can come up with, since there are no binding substance in this except fibers and sugar. A chef’s tip from my great grandmother: leave the jam in the refrigerator overnight so that all the flavours and juices will get a chance to settle, and the jam will be evenly sweetened. I would say this is a good advice, since the “jam” seems to end up juicier when handling and after baking when it has been stored overnight. My favourite pastry to pineapple tarts is light, crisp, thoroughly baked so that you can taste the butter in it and one that melts on your tongue! 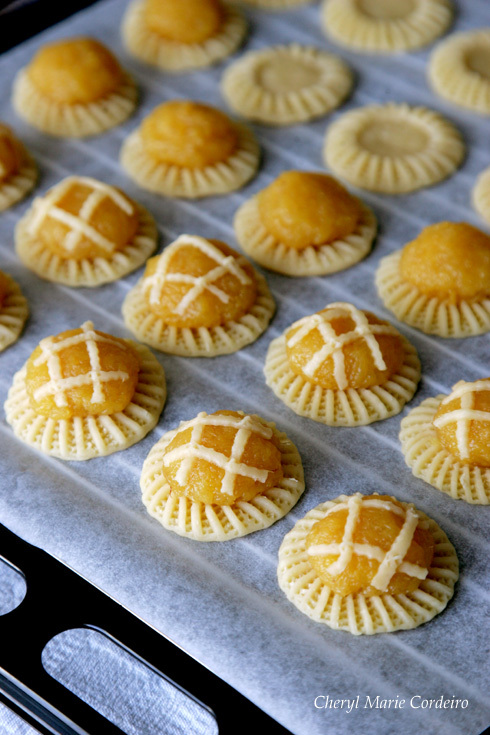 As mentioned above, there are a great variety of ways that pineapple tarts are made in Singapore, depending on one’s culinary heritage. I use a traditional short crust pastry recipe with 1:2 ratio of butter to wheat flour. A pinch of salt and cold water to bind it together. Some pastry recipes would call for the use of 1 – 2 eggs, which in my view makes the tarts gluey but of course less apt to crumb. Some also use vegetable shortening, milk, lye water etc. I think it all works out alright, and this will depend very much on what your preferences are. (If you like gluey tarts, I mean.). 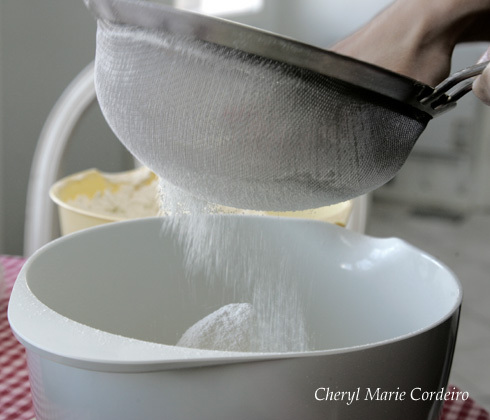 The pastry begins by sifting the flour. For my purposes, I had about 1 kg of flour. 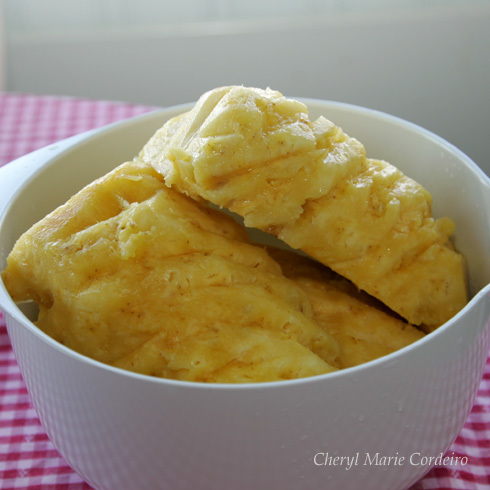 Cubed butter in sifted flour. 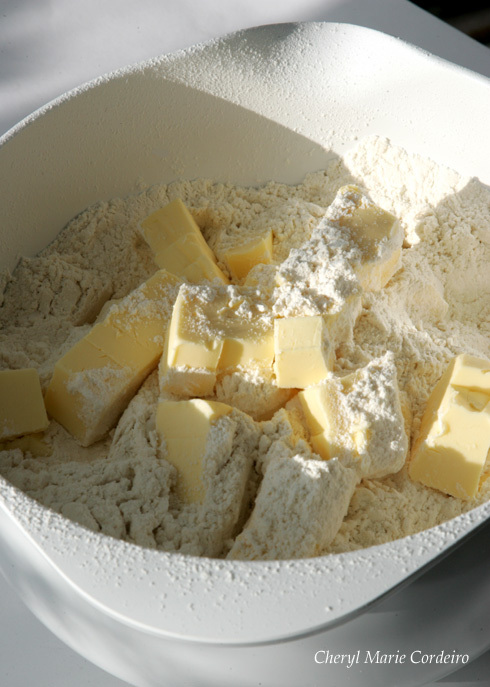 Into 1 kg of sifted flour is 500g of butter, cubed. The butter is then rubbed into the flour till it resembles fine breadcrumbs. A texture of fine breadcrumbs. 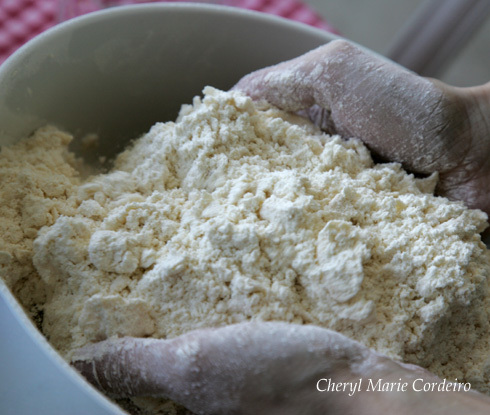 A little cold water is then added to the entire mixture and kneaded till it binds. This is set aside for at least half an hour under a tea towel or plastic wrap. It will work too if you set aside the pastry overnight in the fridge. 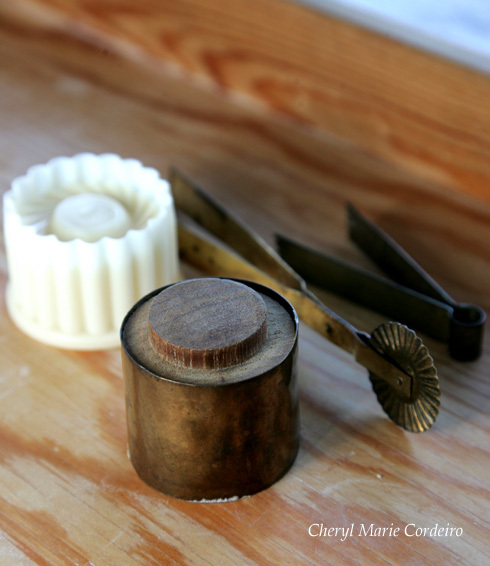 Some tools for tart making. In the foreground, an old fashioned pineapple tart mould made of wood and copper ring. The white one in the background is modern and made of plastic, with ready print insets. To the right of the moulds are the pastry cutter and pincher. It is in the making of the tarts that I most enjoy. Like the Peranakan card game Cherki, tart making is an event that allows a lot of social chit chat, though admittedly several times more the work, which makes it ultimately less popular than Cherki. Still, thinking back, spending time with your family members is always a dear memory to have when you grow up. 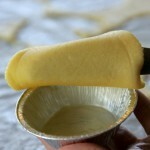 The traditional method is to pinch the pastry base of the pineapple tart. Once the pastry is rolled flat and round pastry bases cut from the wooden mould, the sides of the pastry base is flattened. 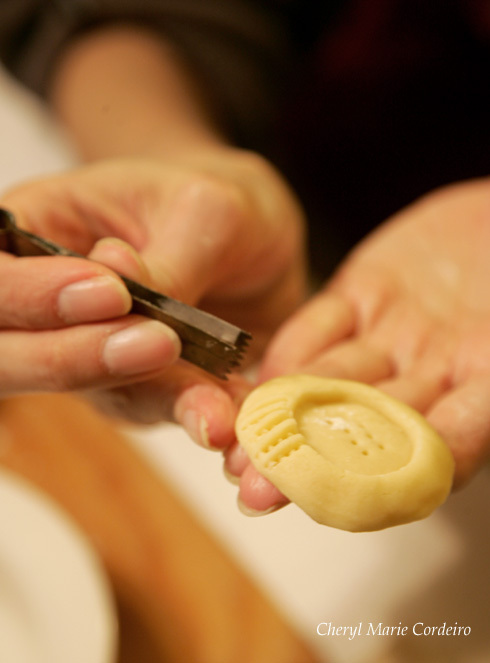 Then, using a copper pinching tool, the base is pinched to raise the pastry in a floral pattern. Putting jam onto the pastry bases. 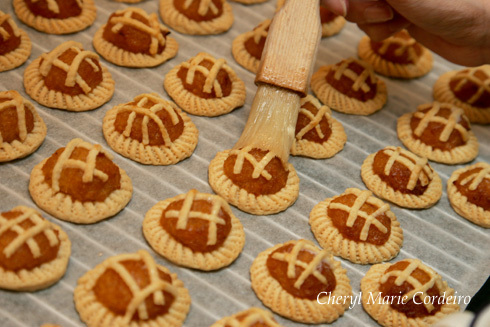 About a small tablespoon of jam is rounded and placed on top of the pinched pastry bases, after which they are decorated further with thin strips of pastry, about an inch long in double-cross fashion to make them look like mini-pies. Tarts in various stages of finish prior to baking. 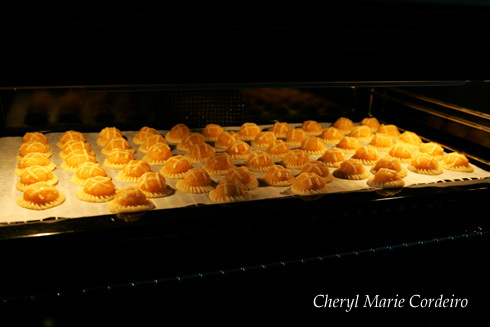 Pineapple tarts baking that usually takes ca. 45 minutes. Once the tray is done, it goes into the oven at 175 C for about 45 minutes or until the pastry turns a golden brown. My preference is for the tarts to be left in the oven slightly longer, so that the jam caramelizes some. To some, this result might turn out too chewy to their liking, in which case you could simply take out the tray a little earlier. Deciding the baking time is one of the most important decision moments for how your tarts turns out. 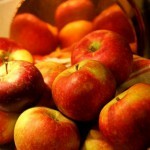 Light color – juicy, dark color – caramel sugary sweet etc. Glazing with egg whites and butter after they’re out of the oven. When the tarts are just out of the oven, a glazing with a mixture of egg whites and butter will add a gloss to the tarts. Pineapple tarts, cooling on the board after glazing. 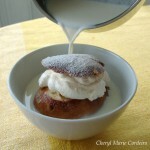 In Sweden, tarts can store for a longer period in their glass jars, because of the cooler climate. In tropical Singapore, we would not make the tarts earlier than at most two days prior to serving, the shorter the better. Having since moved to Sweden from Singapore, the best time of the year to buy pineapples here, is really after Christmas when ripe pineapples could be found at the shop shelves at much better prices than before Christmas. Eventually, in the future, we will reduce our ambitions to maybe just 2-3 large pineapples. 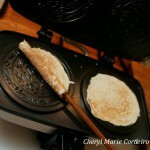 That will still give us about 100 tarts and turn the tradition into something that might fit better into a modern life.